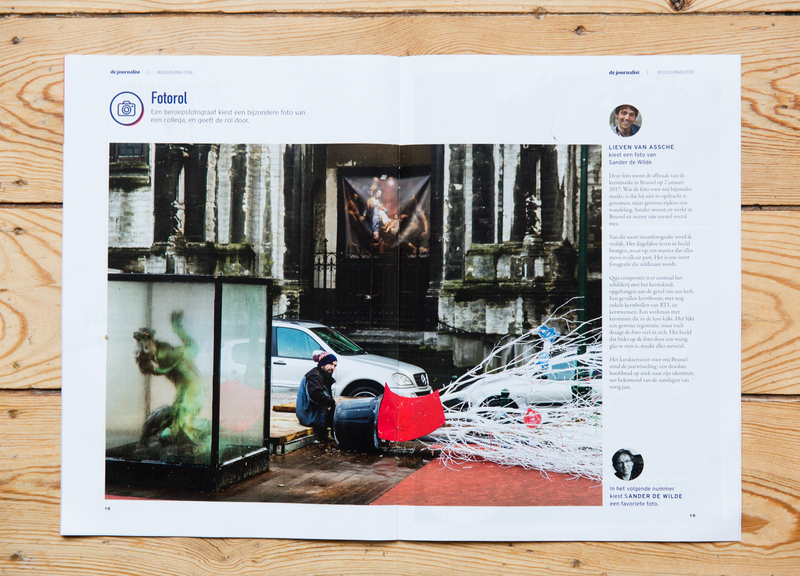 For ‘fotorol’ a new monthly project in ‘de journalist’, (the Flemish magazine for Journalists) a picture of mine was chosen by photographer Lieven Van Assche, also the director of ID photo agency. My pic is the first in a row of pics chosen by a photographer every month. Why I am so happy about his choice is that Lieven speaks really kind words on this specific picture: he talks about the power of street photography, and that not many photographers just walk around without an assignment and still shoot what catches their eye, as I did her in Brussels where I photographed the deconstruction of the Christmas market. The Christmas market had this extra layer of tension after all the terror attacks in Europe last year. The picture has different layers, he says, with the poster of Jezus hanging at the church, the guy deconstructing a white tree, silver cars being reflected in the glass covers of the statues in the basin that’s now covered by a wooden floor for that very market. The guy with hat looking at us, and the red cloth on exactly the right spot. Yes, now Lieven says it so boldly, am I the best street photographer? I don’t know, but I just love walking around with my M9 and a 35/1.4 and shoot around, that I do know! Brussels, January 2017.publication in ‘de journalist’, a Flemish magazine on journalism, covering one of my street photos on the Christmas market in Brussels.